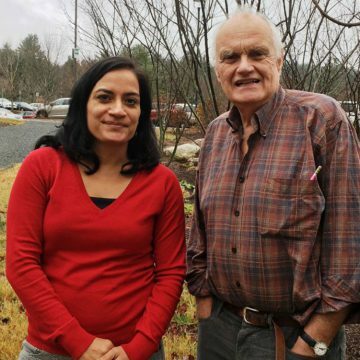 Two researchers at Dartmouth’s Geisel School of Medicine, Peter F. Wright, MD and Alka Dev, DrPH with the Dartmouth-Haiti Partnership (DHP), were announced as winners of the Children’s Prize Foundation’s (CPF) 4th annual Children’s Prize. Under their leadership the $250,000 award will be used to build a model for the reduction of newborn mortality in Haiti. The 30-month project introduces a low-cost, highly effective neonatology service at Hôpital Immaculée Conception (HIC), the referral hospital for the country’s southern region. In doing so, the project will provide critical support of life in acutely low resource settings. The Children's Prize is an annual competition launched globally to fund evidence-based child survival work. The winner will receive funding to carry out the plan they propose. Geisel Aka Dev (left) and Peter Wright (right) were awarded the Children's Prize to to build a model for the reduction of newborn mortality in Haiti. Serving as a referral hospital for approximately 775,000 people in a rural area, HIC currently has no capacity for neonatal resuscitation or ongoing respiratory support. HIC needs a neonatal team trained to distinguish and identify stillbirths from newborns requiring resuscitation at birth. The winning plan proposes to: 1) introduce neonatal resuscitation; 2) establish a new neonatal service with capacity for Continuous Positive Airway Pressure (CPAP); and 3) train key health staff in neonatology care, creating the opportunity to save more lives. CPF Founder Ted Caplow remarked, “Dr. Wright's proposal aligns succinctly with the mission of the Children's Prize. It is straightforward, scientific and efficient. Founding a neonatal care unit in a significantly low resource setting will require skilled practitioners armed with a robust and streamlined equipment package to ensure the prize investment is maximized. This proposal includes adding a full-time physician to the hospital community to focus on neonatal care, and we believe the impact will be both substantial and direct, especially in a country with so few doctors and limited access to adequate health facilities." At the center of the winning project is Sustainable Development Goal (SDG) 3, which puts forth the target to reduce neonatal mortality to 12 per 1,000 live births by 2030. In 2013, there were 6,713 neonatal deaths in Haiti, and nearly 65 percent were related to respiratory distress. The Children’s Prize annual competition will welcome applications again in April 2017. The Children’s Prize Foundation (CPF) thinks like an engineer, placing its strongest emphasis on efficiency and scientific accuracy. The foundation empowers and unites the drive of human competition with the hyper-connectivity of the information age by administering a global, annual contest, the Children’s Prize. This initiative invests in proven child survival work. As a novel philanthropic approach, we insist on a direct link to lives saved for all children under five years of age. The Children’s Prize Winners enter into a collaborative relationship with the CPF to execute their vision. Founded in 2013 by Dr. Ted Caplow, the portfolio of projects includes investments in Pakistan, Nepal, Kenya, Uganda, Angola, Sierra Leone and Haiti. For more information, please visit www.childrensprize.org. The Geisel School of Medicine at Dartmouth, founded in 1797, strives to improve the lives of the communities it serves through excellence in learning, discovery, and healing. The Geisel School of Medicine is renowned for its leadership in medical education, healthcare policy and delivery science, biomedical research, global health, and in creating innovations that improve lives worldwide.